Making beans from scratch is pretty simple. It does take a bit of time, but that is about it. First of all, when you get your beans out to cook, always rinse them first. Even if they don’t look dirty. They just get run through a shaker to get rid of the dirt clumps. But they don’t get washed. They also need to be sorted. You may find a rock or clump of dirt among the beans. Some of the beans are probably broken. To rinse them, cover with water. Take out any beans that float. After you have rinsed and sorted through the beans, you may want to soak them. Some people believe it shortens the cooking time. It does, but not by much. So soaking is pretty much your call. Lots of people get gas from beans. There are some things people do to try and prevent this. One way is to add baking soda to the cooking liquid of the beans. Some people swear it works. Use no more than a teaspoon per pot of beans. Another method is what I use. Truthfully, I don’t seem to have much gas at all when I do this. Add a spoonful of bacon grease to the bean pot. The addition of animal fat seems to help the beans digest easier. So to cook the beans, add the beans and optional bacon grease or baking soda to a large pot. Cover the beans fully with water. Bring to a boil and lower the heat so the beans are bubbling gently. Partially cover the pot. You want to let some steam escape. The beans will be down in an hour to and hour and a half. About 15 minutes before they are done, season them how you like. They are done when you can blow on a bean and the skin will split. It will be creamy throughout with no crunchiness. Yes, you can just get a can of baked beans from the store. 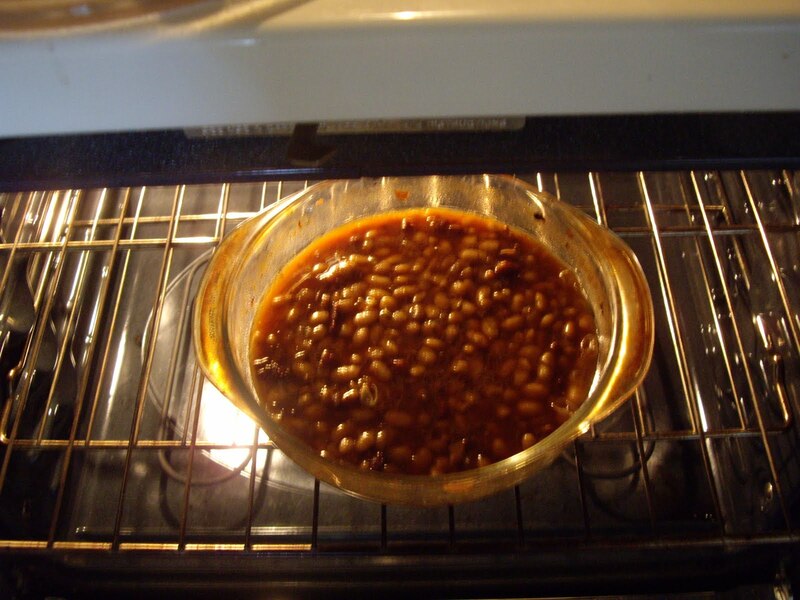 But there is nothing like making your own old-fashioned baked beans. You could take a short cut and start with canned beans. about 3-4 sliced bacon, cooked and crumbled. Or if you have some leftover ham use that. 1 teaspoon dry mustard. If you don’t have dry, use 1 Tablespoon prepared mustard. Rinse and sort the dry beans. Cover beans with water and let soak for a couple hours up to overnight. Cook your bacon in the bean pot. Remove bacon from drippings. Cover the beans with water and add a handful of the chopped onion. Partially cover pan and turn heat down so the beans are simmering gently. Cook beans, stirring occasionally, for about an hour to an hour and a half. Add more water, as needed, so the beans remain covered by about an inch of water. They are ready when you take a bean out with a spoon and blow on it. The skin will burst open. Take off the heat. Drain the beans, but save the liquid. In a 2-1/2 quart bowl or baking dish mix the beans, bacon(or ham) and onion. Stir in 1 cup of the bean liquid, the molasses or maple syrup, brown sugar, mustard, salt, and pepper. Cover the dish and bake in the preheated oven for about 2-1/2 hours, or until it is as thick as you like. Add more bean liquid, if needed. Serves 10-12 as a side dish. If you are using ham, you can add some bacon grease to the pot of beans or use vegetable oil or just skip that part all together. If you want to make beans and weinies, cut up hot dogs and add to the baked beans about a half hour before the beans are done. Any sooner and the hotdogs seem to lose most of their flavor.